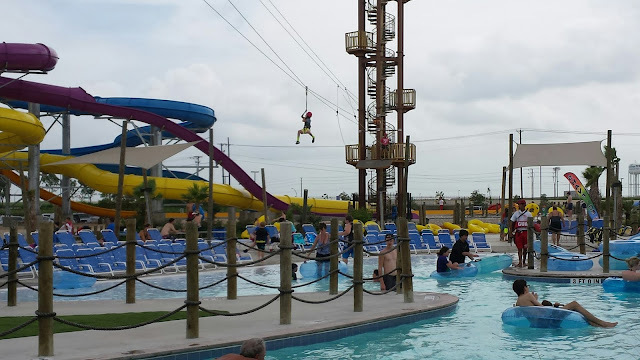 Hawaiian Falls: On the Ropes! Aloha! 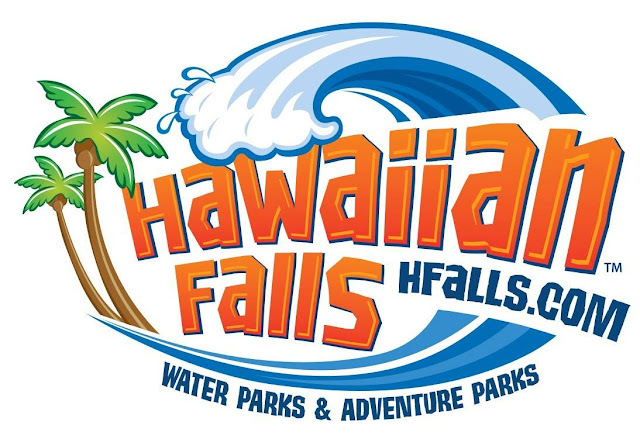 Today I want to share about a local water and adventure park my family has been enjoying this summer, just 15 minutes outside of Austin Hawaiian Falls Pflugerville. They have several locations all over Texas, with this being the newest and one of the only ones to have an Adventure Park, with a ropes course, zip lines, free fall drop and climbing wall. I really like water parks, but this place has so much more, which is why I love it! My teenage son, Jonathan who has admitted to me a tiny fear of heights, braved the obstacles, and some of these are pretty legit! Whether that was because the course beckoned, or he didn't want to get shown up by his little bro, he went for it after all! We did a Canopy Course in New Braunfels at Natural Bridge Caverns and although it was a good time, being in a solid track system, you never felt unstable there, no danger, you could literally hang by your harness and not move. 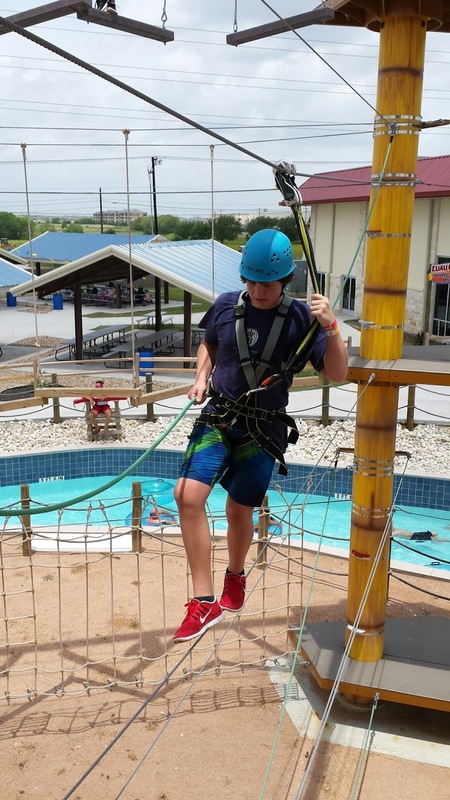 At Hawaiian Falls, your smart belay system is attached to a second cable while you carefully walk leaf, jump, hang or climb across tilting beams, tiny platforms and hanging cargo nets. 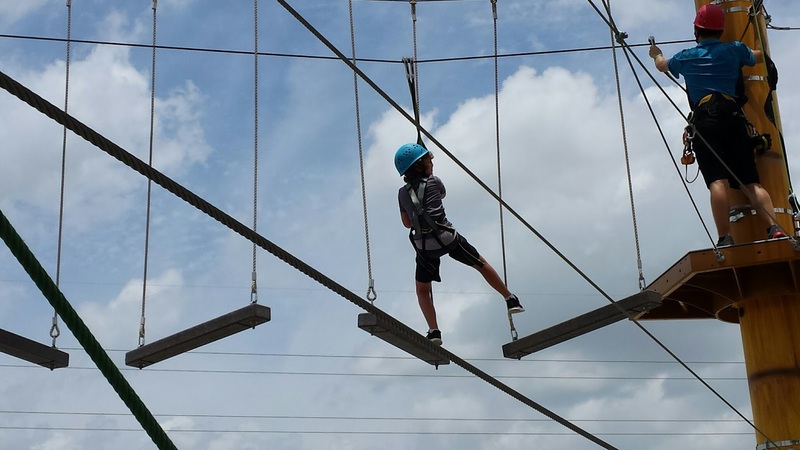 So while you are always safely hooked in, you are not balanced or guaranteed to make it to the next obstacle without careful navigation (but you can grab on the "wimp rope" (my term, and yes, full disclosure, I had to rely on it a few, but not every, time) or your harness to steady yourself, don't worry! Great core workout! I won't name names, but one member of my (not immediate) family, actually got stuck on one of the dangling cargo nets and had to be retrieved. It's not easy! You feel like a beast when you're done! Roar! 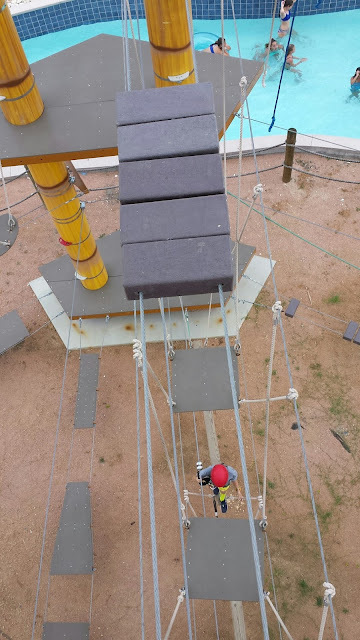 This was my second time to do it this week, and I admit I did reach up a few times to just check to make sure both belays were definitely tethered before stepping out three stories onto a cable. I fished my smartphone out of my pocket and risked smashing it several stories below just to give you this pic! That's about a 5 foot gap there to either leap to the next solid step, or, trudge across the cables. Here's William making his way across the swinging beams on the 3rd story. These move a lot. No wimp rope to grab here! Now the zip lines, honestly, jarred me a bit at the stops when I first tried the zips here last autumn, so I didn't do it the time before last, and may not recommend the zip part if you have neck or back issues, but really enjoyed taking some photos and videos of the kids flying over the park. But, this last weekend, I went on it again, asking for tips from the attendant to minimize before taking the leap of faith. "Curl up into a ball right before the end, it keeps your arms and legs from flailing." I have to say this really helped! So much better. Highly recommended. Fun, safe thrills. You are not allowed to have your phone on for aerial views, but here's someone flying over the lazy river! I am so impressed with this organization and after meeting some of the management and sharing I had a blog, they offered to sponsor some specials and giveaways I can share here with you throughout the summer! Don't wait to try it though, if you have a good day to go! They have so many great deals, that if you plan it right you'll never have to pay fill price! Currently available: 2 for 2 Sundays, Maui Mom Mondays, get in free with purchase of child ticket, and $2 Tuesday, buy one get one for just $2!) Combo family packs can also be purchased through Costco if you have a membership, just $99 for 4 which includes 4 combo meals! Next I think we will check out Friday Night Slides, where for only $10 you can slide from 8-10 PM (on Friday) with slides lit up with LED for a very different nighttime experience! Wish I could get photos of that! Thursdays for the rest of the summer they will also have movie nights where you can relax in a tube in the wave pool while watching a family on a gigantic outdoor screen. TIP: To make the zippers meet in a “V”, the midway point of the bottom of this card is 2 3/4”. You can make a tiny mark at the bottom (before doing any shaping at the corners), and then stamp the zipper each time going through this mark. Joyce Erb hosting a new "fast and easy" challenge today over at the Mod Squad Challenge Blog this week and I'm sponsoring. Well, Triple Play Fillers is easy to use on a "Fast and Easy" card for sure! Here is a card I made with this set, don't you love this zipper. TIP: When using the zipper, cut just a tiny notch where it open s to reveal a cardstock layer underneath. Ink is GKD Dark Chocolate and cardstock is GKD Pure Luxury Passionate Pink, Dark Chocolate and White. Greeting and heart are from Triple Play Frame. I am sponsoring the challenge with a prize this week, I hope you can play along! Go see what Joyce has created and the challenge rules. on a card for your bestie? Please enjoy! Fillers for your new favorite frame set are here! 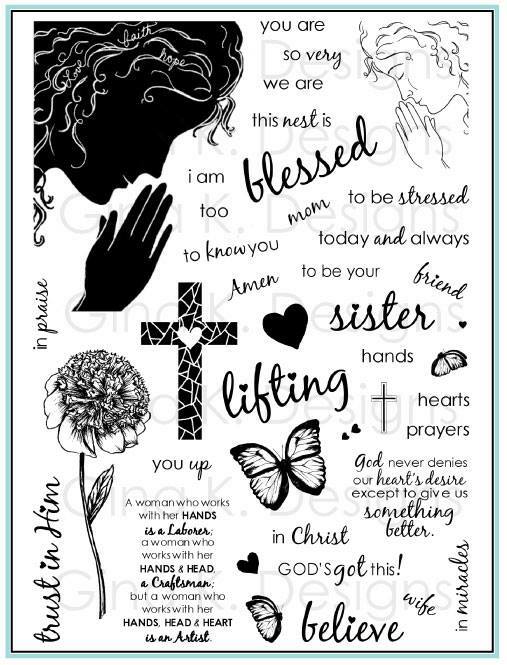 Triple Play Fillers decorative elements and greetings designed to perfectly fit and customize the Triple Play Frame, these stamps can do so much more. 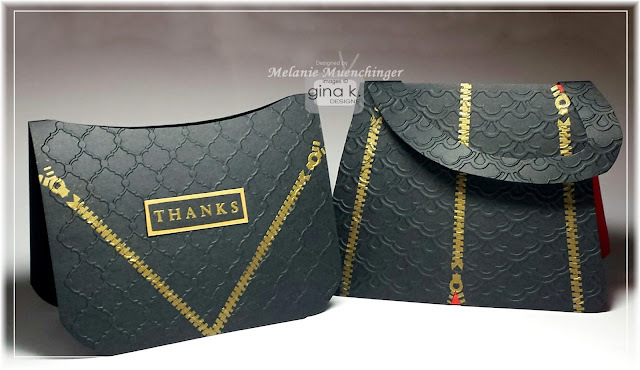 You will love having bows, bits and borders plus embossable two step images like buckles, zippers, and stick pins to bedazzle all your projects, masculine or feminine, any occasion, in a flash, even when you aren’t using the frame! 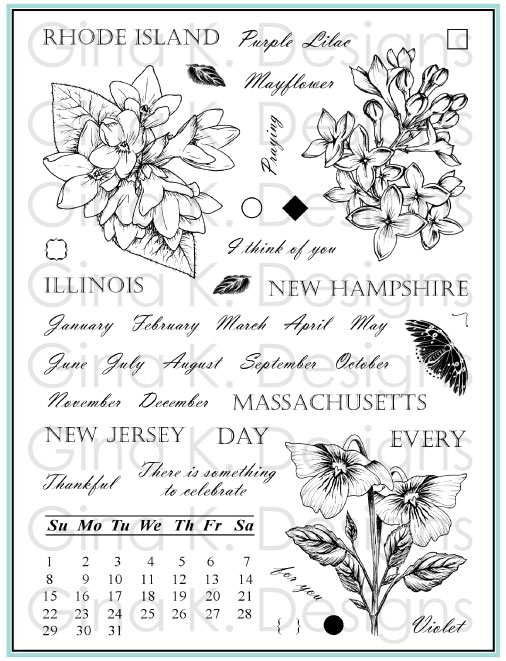 This fabulous set of stamps is a must have for any stamper’s collection and contains 39 images and sentiments. Time to play! I've included both images sheets in today's post for your reference. There are so many coordinating elements across so many of my sets, it's hard to remember all the possibilities! Bold circle rim works as a two-step to fills the borders around the frame’s three round windows. Punch out the inside with a 1 ¼” circle punch, or punch around the edge with a 1 ½” circle punch. 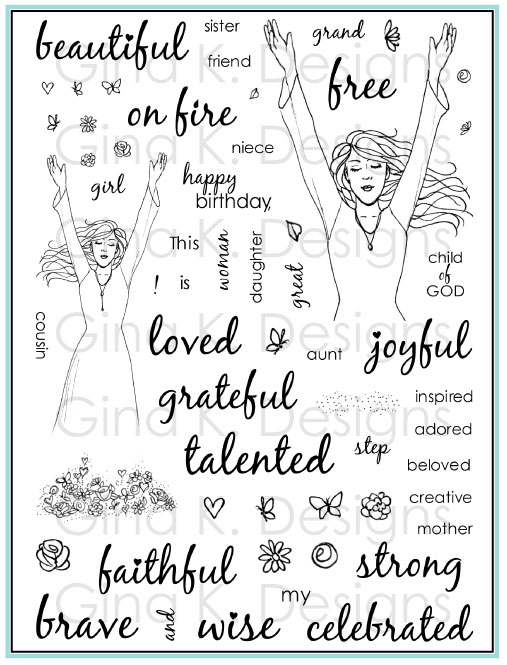 Great for tags! Emboss them for a metal edge. Diamond, belt, Moroccan and zipper borders measure 4 ¾”, and fit exactly across the inside of both long sections of the frame. Stamp Moroccan, Diamond or even the dashed or dotted straight borders from Fabulous Frame Fillers to add detail on your belt, like it has been stitched or tooled. Tiny bold image is included to two step stamp filler for the Moroccan border. This border coordinates with the larger border in Pretty Patterns 2. 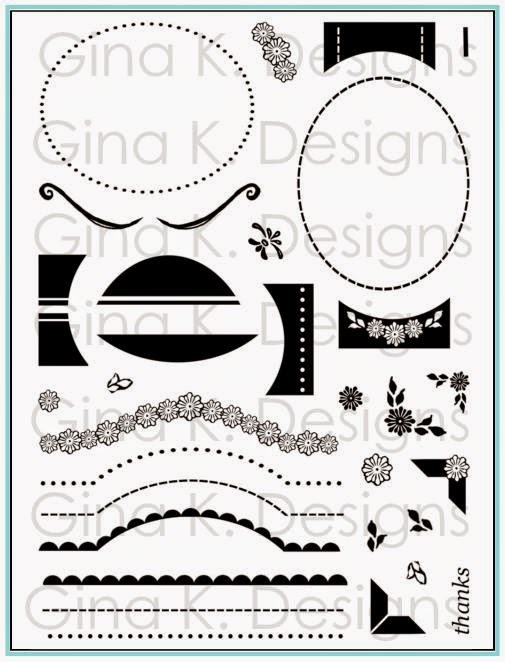 Patterned hearts fill the large heart outline in the border Triple Play Frame. 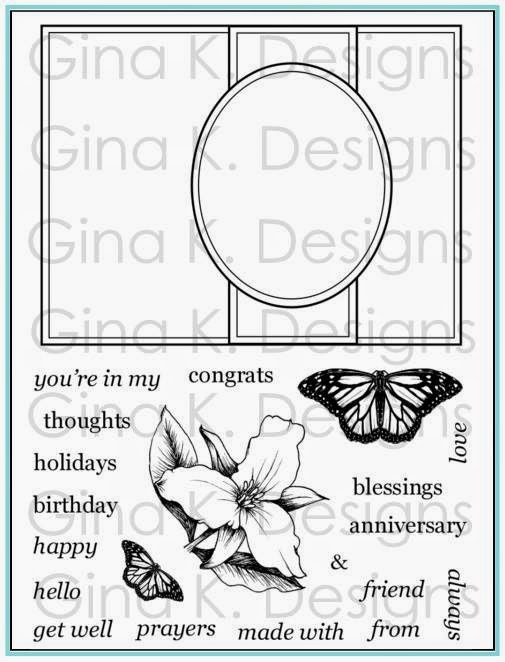 Created patterned clover, flower or butterflies with the heart images stamped to make wings, petals and leaves. Patterned and solid diamonds two step stamp easily into the open diamond border. Mix and match colors and patterns for endless looks! All pattern elements in this set (polka dot, plaid, and houndstooth) coordinate with the patterned pieces in Fabulous Holiday Fillers. have fun using these pieces together for coordinating patterns on the same project. Patterned “bow ties” and corners fill the middle section of the frame. Add the coordinating patterned corner piece to all four corners to look like you have paper-pieced this entire section. Use the patterned tiny corners on 1 or more corners of your square and rectangular mats. 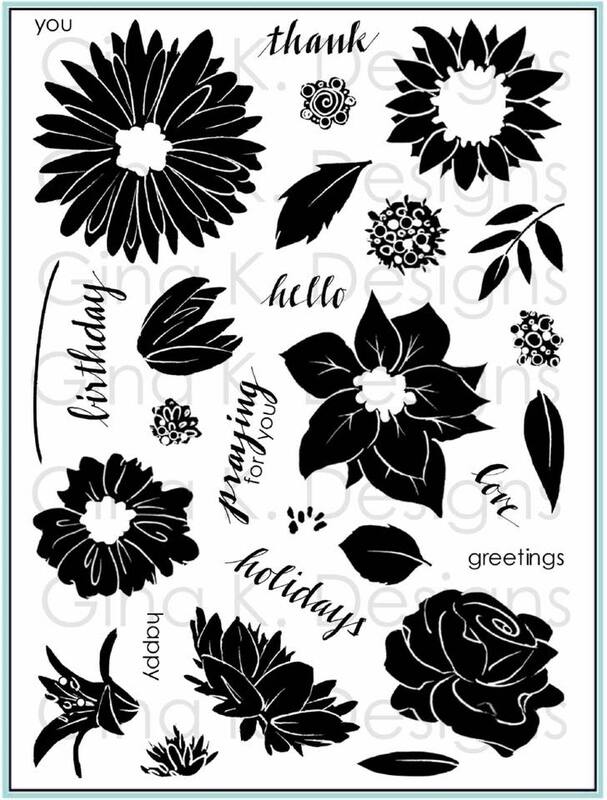 It will look paper piecing behind a rounded corner punch! Circle elements from Triple Play Frame and Fabulous Holiday Fillers fit inside the larger star's opening, and the solid belly band filler (bow tie) that has the open circle. Dashed and dotted circles nest inside the frames round windows and can be punched with a 1 ¼” circle punch. 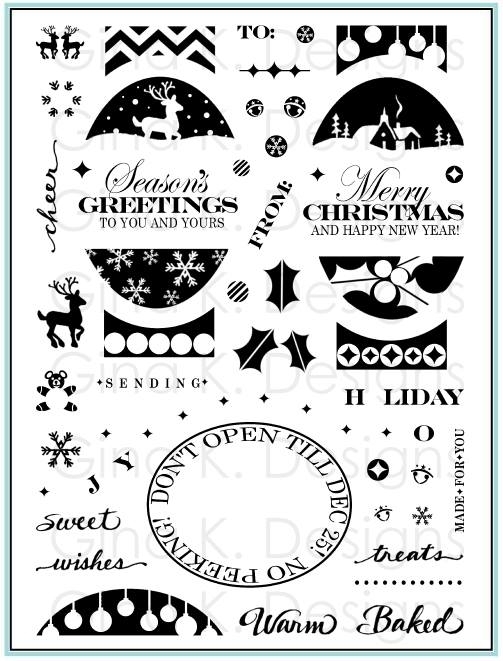 Rectangle tag fits both long sections and fits almost all words from Triple Play Frame, Fabulous Holiday Fillers, Fabulous Frame. Fits exactly across the largest long section of the frame when the frame is turned portrait style. 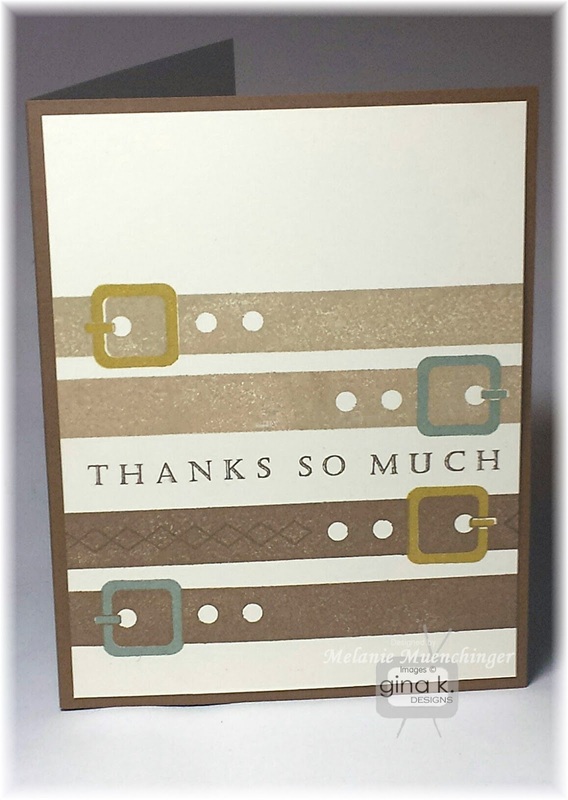 Emboss the zipper, belt buckle and stick pin elements with metallic EP. Make the zipper more dimensional by stamping the pull tab again separately and cutting out to add on top of the zipper border with a piece of foam. Small hearts from the Triple Play Frame set two step stamp into the open heart in the zipper. Make your zipper more realistic by cutting a tiny "v" in your cardstock mat where the side of the zipper open up to reveal another piece of paper underneath. Add round gift bow to the round windows. Punch out with a 1 ¼" circle punch for quick cutting. Layer bows over the Washi tape image to look like a ribbon wrap. Make the bows more dimensional by stamping two or three out and cutting them in smaller parts, to stack on top of one another with the largest, full image being on the bottom. 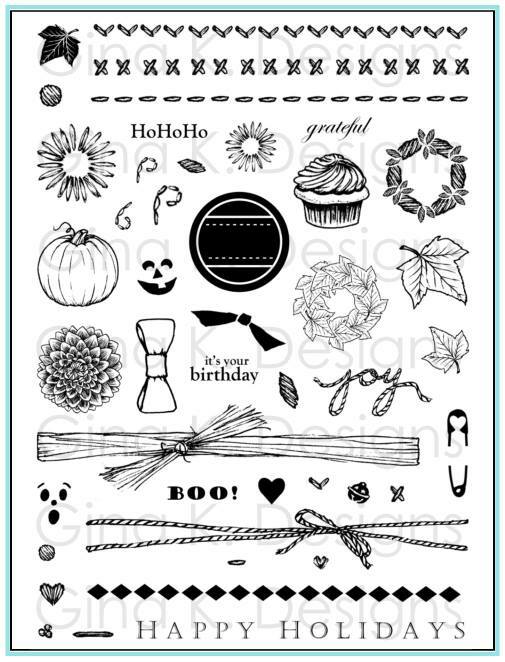 Stamp patterns from this set and others onto the stamped bold Washi image. For images wider than the Washi, create a reverse mask by stamping the Washi first onto scratch paper and cutting out. 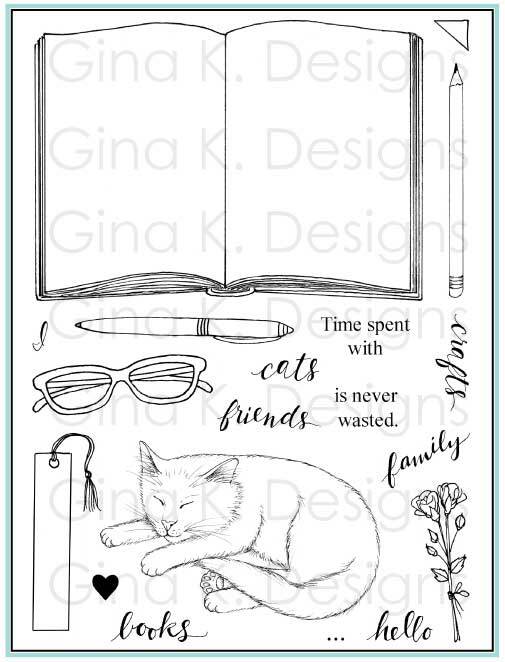 use the paper surrounding it to layer over the stamped washi on your cardstock mat and stamp images. Remove mask. Stamp the long sentiments above, below, or over the bold belt and Washi images. 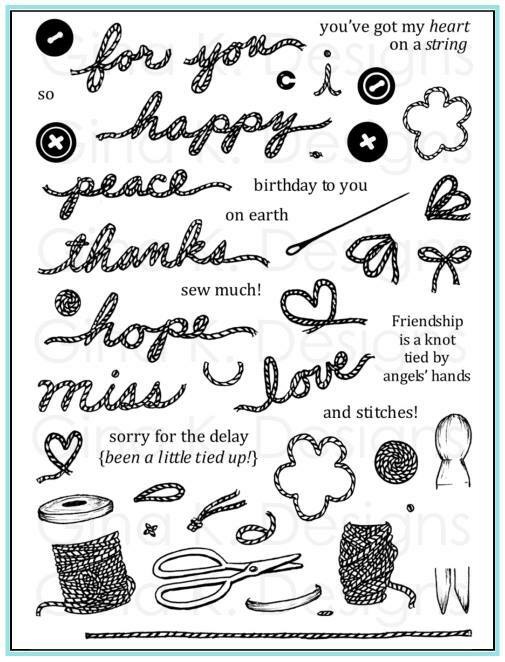 You can also stamp these greetings over the zipper, Moroccan, or diamond borders, but the pattern will need to be in much lighter ink than what you choose for the sentiment in order to read it well. 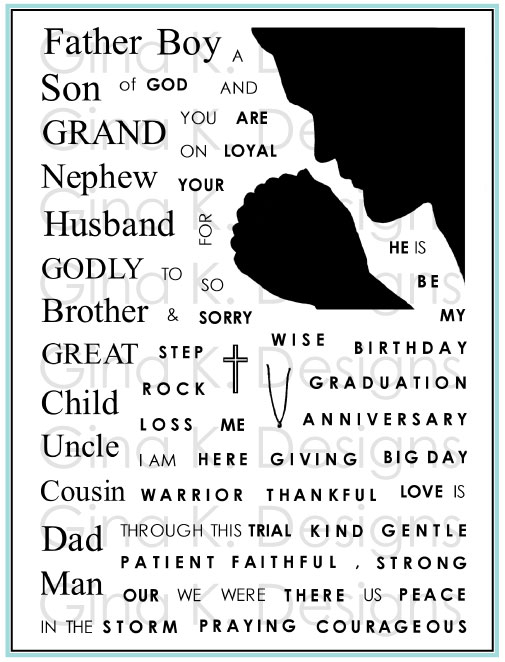 Use the vertical sentiments in the long sections of the frame for portrait style layouts. 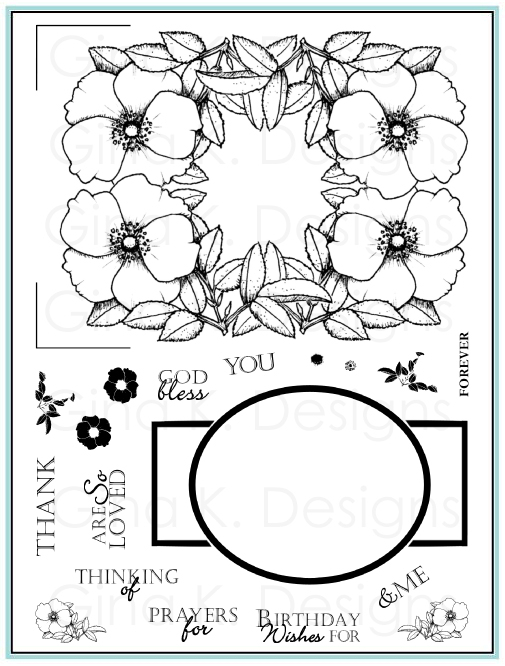 Omit the "o" s in Thinking Of You and Thanks So Much and replace them by stamping in or popping up the round elements form the coordinating sets or these new patterned hearts. Add stick pin pieces one either side of the two bows. Top the stick pins with small round or themed elements in Triple Play Frame or Fabulous Holiday Fillers. Create interesting negative circle patterns by repeating the patterned bow ties, and open circle gaps will appear in between. Nestle the double bow image in the two spaces between the round windows in the belly band area of Triple Play Frame. That's all for now! So much more to come! And videos to show these tips and move in action!